After being booed off the court by their home fans for losing Game 1 Saturday, Joel Embiid and the 76ers returned with a vengeance in Game 2. 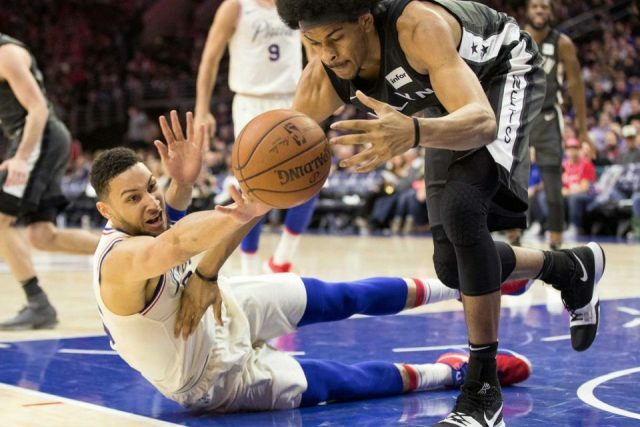 Ben Simmons was key for the Sixers, after being underwhelming in Game 1. He ended the night with 18 points, 12 dimes, and 10 rebounds. Simmons’ triple-double paired with Embiid’s 23 points and 10 rebounds propelled Philadelphia to a 145-123 win inside the Wells Fargo Center Monday night. The offensive explosion for Philadelphia set a new franchise record for points in a playoff game. If there’s one thing this game didn’t lack, it’s playoff-level physicality. There were flagrant one fouls called on both teams in the first half, including this elbow on the post-spin by Embiid. Philadelphia owned a one-point lead at halftime, with some of the early scoring coming from unexpected sources. Boban Marjanovic — averaging a career-high 8.2 points per game since being dealt to the 76ers — scored 8 in the first quarter alone on 4-for-4 shooting. Once the third quarter kicked off, Brooklyn’s luck ran out. Philadelphia outscored the Nets 51-23 during that period and went into the fourth quarter with six players in double figures. Brooklyn’s two talented point guards in DeAngelo Russell and Spencer Dinwiddie were their only bright spots by the end of the night. But even those positives weren’t too special. Dinwiddie led the Nets with 19 points off the bench on 50 percent shooting. Russell, recently selected to his first All-Star team, added 16 points, which all came in the first half. The series will now head to Brooklyn tied 1-1. Game 3 is set for Thursday, April 18 and will tip off at 8 p.m.